Residents play SimBethel at annual Bethel Island Safety Fair, October 2012. The California Delta is one of the world’s most complex water systems. As a group of five Dutch students from Delft University of Technology, we were eager to visit the diked islands, or “polders,” as we call them in the Netherlands. We wanted to learn how California balances the region’s often-competing needs of flood protection, water supply and ecological health. But we also wanted to contribute something useful to local decision-makers and residents while we were there in the fall of 2012. 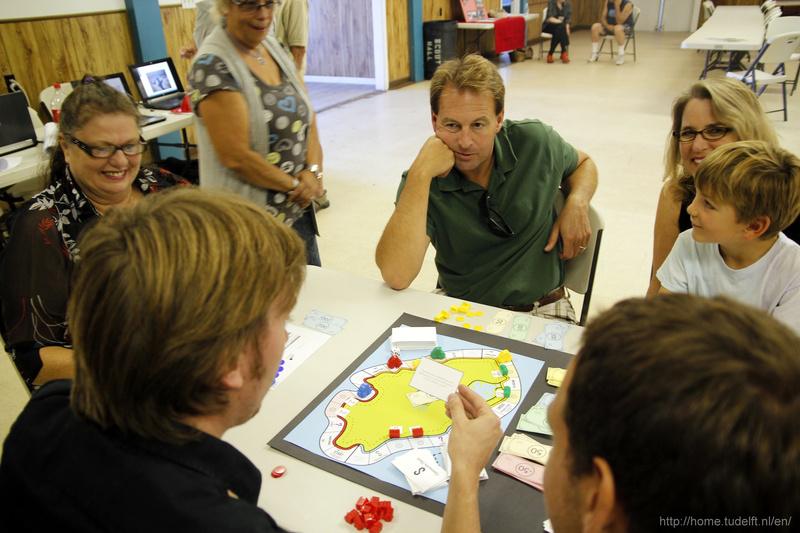 We had in mind a fun and educational board game that would simulate the interplay between Delta flood risks and development interests. As with computer models, simulation games can provide insights for better planning and policy discussions on complex, real-life problems. 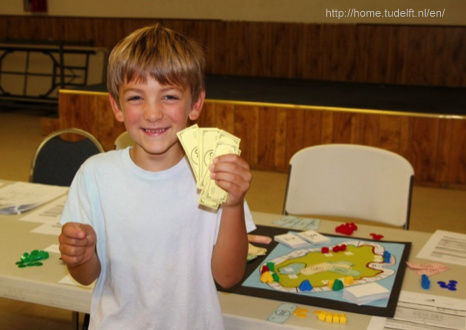 Games have the added advantage of taking into account human behavior. For example, players are likely to respond differently to a simulated flood, provoking discussion over the best course of action. The Delta – with all its complexity, risks and political debate – seemed like a good subject for such a game. Bethel is one of the most populated Delta islands with about 2,600 year-round residents. The single levee that rings Bethel is in poor shape. The structure doesn’t even approach the standard that obligates the federal government to provide emergency aid in floods. We were surprised by the lack of awareness or regard for levee safety, particularly among residents who live alongside it. Some landscaped the dike as an extension of their yard and garden. Others carved out a beach for themselves in the outer slope. Such encroachments would be unthinkable in the Netherlands, where the government keeps a close watch on levees. The levee is property of the waterfront owners but the Bethel Island Municipal Improvement District is responsible for its safety. The district’s share of property tax revenue does not approach the amount needed to upgrade the dike let alone to properly maintain it. 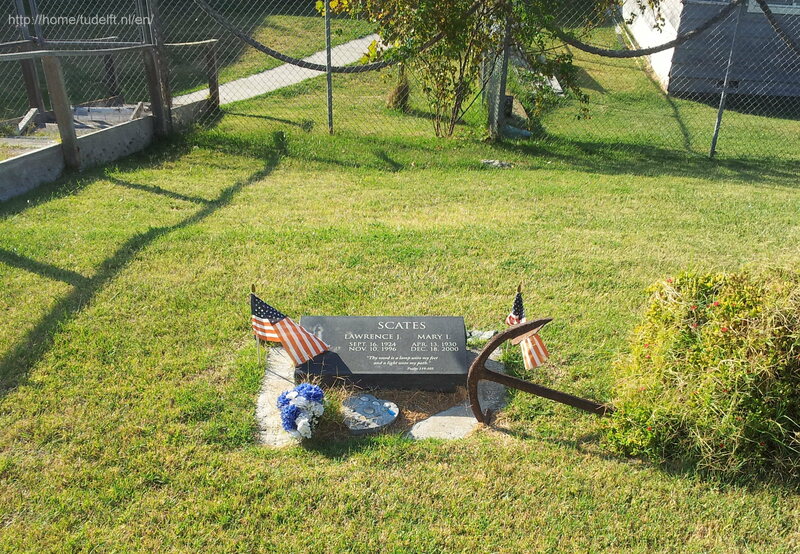 In 2009, islanders voted down a special parcel tax for levee improvements. Given the deadlocked situation, we designed SimBethel to help decision-makers identify strategies for more sustainable flood management, and to raise residents’ awareness of flood risks. The Bethel Island Municipal Improvement District is responsible for the levee’s safety. 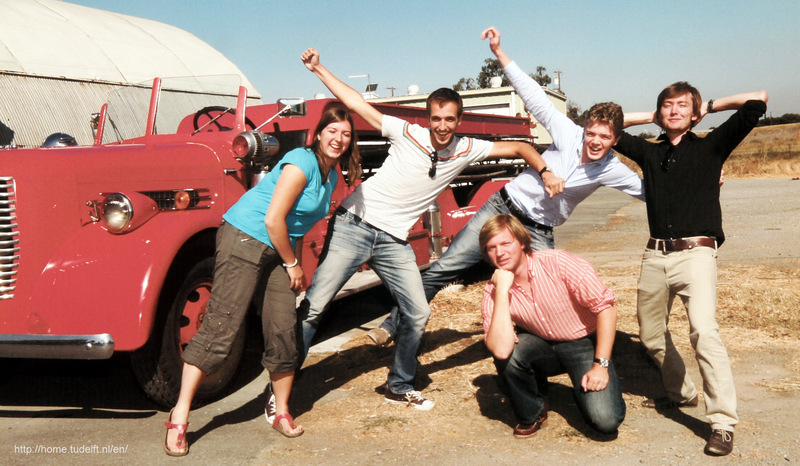 In our first round of testing, at UC Davis, players found the game too complex. Even hydrology students had a hard time following the rules. 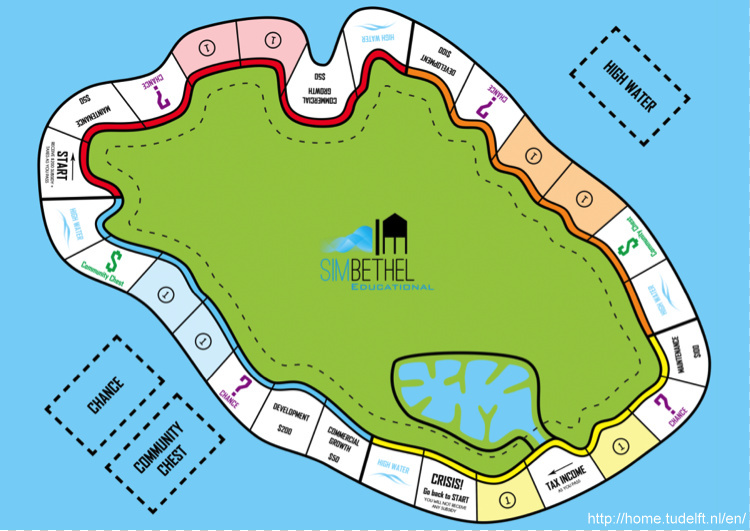 So we redesigned SimBethel purely as an educational game for island residents. The same group of test players found this version much simpler and more fun to play. The goal of SimBethel is to upgrade the levee around Bethel Island to the highest safety standard. Players are responsible for their own levee section. They can upgrade their section out-of-pocket or build houses to generate revenue for improvements. However, without development it is almost impossible to win; there is not enough revenue generated to strengthen the levee. Players have to find a balance between developing and protecting. 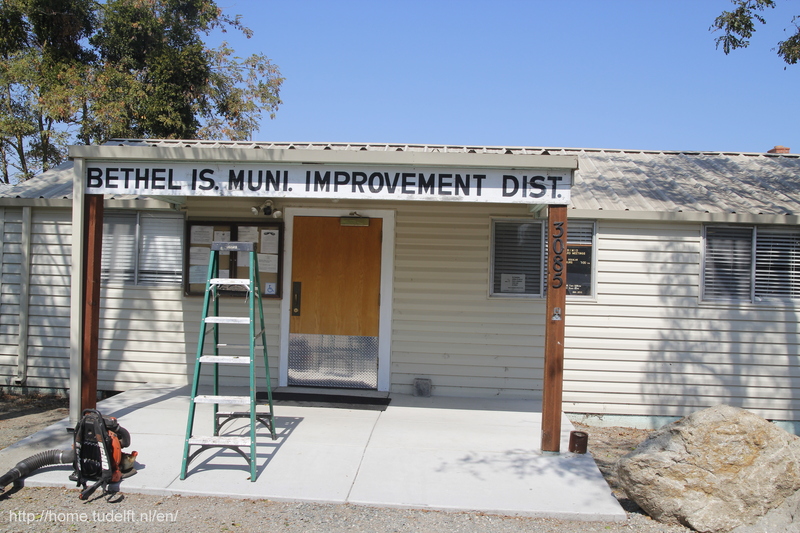 On Bethel Island, the game drew enthusiasm from residents serving on the Bethel Island Municipal Advisory Council, a family living in a trailer park and several others attending the island’s annual Safety Fair. “Floods” were the most exciting and educational element. SimBethel drove home the point that the island is only as safe as the “weakest link” in the levee. If the island floods, every player must pay for the damage they sustained – no matter how much money they poured into strengthening their section of the dike. The real Bethel Island is at a turning point on flood protection. Some residents have created their own protection by building or raising their homes on stilts. Developers of the stalled Delta Coves marina community built a giant plot of raised earth to plant 495 units. The elevated building pad cost an estimated $140 million. By comparison, it would cost an estimated $125 million to reinforce the island’s entire levee against seepage and earthquakes. When putting collective flood protection in this perspective, it doesn’t seem so unachievable. It would allow non-elevated development on Bethel Island, significantly lower residents’ flood insurance premiums and entitle the community to federal emergency aid in a disastrous flood. For Bethel Island, a collective approach to flood protection seems more effective and efficient than the current strategy of elevated development. This is exactly the lesson that emerged from playing SimBethel, and it is the core principle of the Dutch polder concept. Wouter Jan Klerk recently earned his masters degree in the field of Hydraulic Structures & Flood Risk from Delft University of Technology. Ties Rijcken is a researcher at the university studying the use of games for insights into flood safety. They were part of a group of five Dutch students from the university who visited Bethel Island for the project, as shown in photo below. This entry was posted in Uncategorized and tagged California, Delta, Delta island, flood protection, SimBethel, Ties Rijcken, Wouter Jan Klerk. Bookmark the permalink. OMG as someone who spent nearly 30 years trying to get delta interests to understand the scope and gravity of flood risks this is amazing. Now lets see they are willing to take care of themselves and pony up the bucks needed to deal with it, Frankly if past is prologue I doubt they will. But at least they better idea what flood control operations folks have to deal with, having to choose which islands to let flood in events like January 1997. This game sounds awesome. What a wonderful educational tool! Where can we purchase this game?? Jessica, the game is currently not for sale. However, it could be in the future. In case you’re interested we could notify you if and when the game is to be produced. 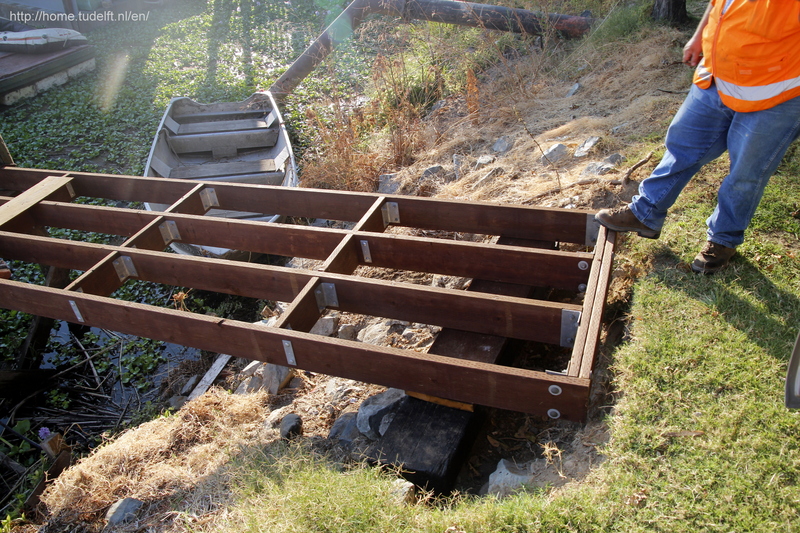 I am currently planning the home for part of the Delta Coves project. Expect construction to star first quarter 2019. Please add me to the list of people who would buy a few copies of the game. It tells us so much about the differences between the US and the Dutch. In the US it’s all about don’t raise our taxes no matter what, whereas in the Netherlands they needed a huge horrible flood (1956?) to get folks off their butts and be willing to pay a lot no matter what to protect their country to the highest standards. It’s a sad situation plus there’s the whole issue of global warming. Even when Delta Coves is sitting there unfinished and big banks that financed it go bankrupt, SunCal thinks it can still be ‘developed’ In the Netherlands they probably wouldn’t even allow this kind of project in the first place and there’s sssoooo many projects in the Sacto. delta that are in the ‘shouldn’t have built in the first place (this means you Summer Lake, Mossdale Landing, Emmerson Ranch and Discovery Bay!!!!). It would be kinda cool tho if the could build a calif. version of Kinderdijk here in Ca. maybe on Bethel Island instead of this ‘on the cheap’ version they have now. Great idea! IS the game for sale now? I keep asking myself why they don’t insert a “wall” into the dikes. Take a large rock wheel that can cut a narrow trench into the CENTER of the levee, and pour concrete into it, to form a solid wall, that will prevent the intrusion by water through burrows made by rodents, or soft spots naturally occurring. It would not be that expensive and would add security to the dike system with a spine in each dike.